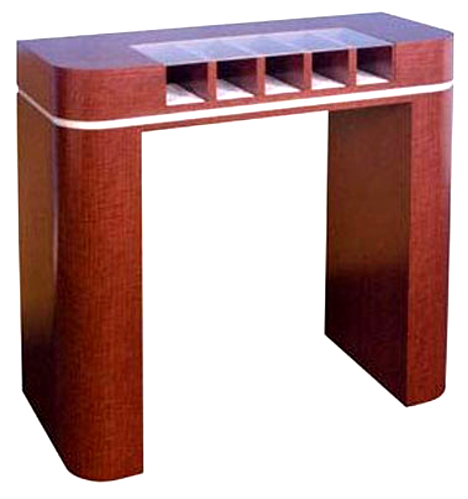 One-sided check desk, shown in cherry finish, has a curved laminate counter with 5 compartments. It has a flush-mounted writing top, feature strip and a curved pedestal. It is finished on all four sides and shipped fully assembled. Available in 10 finish choices: red mahogany, cherry, golden oak, walnut, light oak, colonial, black, gray, silver and gold. Dimensions: 42" H x 42" W x 17" D.
One-sided check desk, shown in cherry finish, has a curved laminate counter with 5 compartments. It has a flush-mounted writing top, feature strip and a curved pedestal. It is finished on all four sides and shipped fully assembled. Available in 10 finish choices.